Rick Yancey Archives - Book.Blog.Bake. When I sat down to read The 5th Wave, I told myself I was going to let myself read for thirty minutes after lunch before going on a walk. My walk that day ended up being more around 4:30 than 1:30, because once this book hooked me, it wouldn’t let me go, even for a bit. The entire three hours I read this book, I took it everywhere– into the laundry room to put clothes in the washer, into the kitchen to get a glass of water, etc. I had to read every page as fast I could because I had to know what happened next. 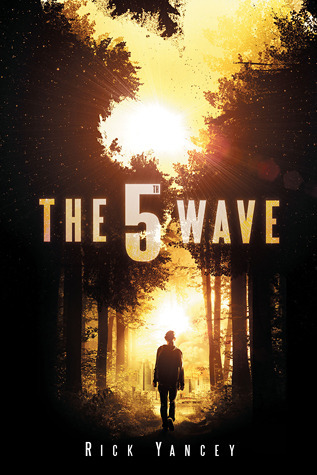 I KNOW this book has been hyped and I know if you’re like me, you’re worried it won’t live up to it, but I have to say, from my perspective, The 5th Wave was everything I was expecting/hoping for. Cassie is potentially my favorite character of the year. She’s strong and sarcastic, but there’s definitely a learning curve. I have a feeling a lot of people will compare her to Katniss, and while I think that’s a valid comparison, there’s one huge difference: before the invasion, Cassie was just an average high-schooler. She had a huge crush, went on a date, talked to friends, etc. The normalcy of her life before makes the invasion and her survival all the more frightening and impressive. The 5th Wave is split up into sections, and is told through multiple point of views(though not equally– Cassie is definitely the main character and gets the most on-paege “screen time”). This technique is normally a hit-or-miss for me. There are books that do it really well(like Unwind, by Neal Shusterman), but unless a really skilled writer is the one using the technique, it typically falls flat. I’m happy to say that Yancey is one of those skilled writers, and the way the book is split up is perfect. I didn’t know if I’d like it or not, but I have to say once I reached the ending, I appreciated the organization so much more. The 5th Wave is actually a lot less action-y than I thought it would be, though the last third of the book more than makes up for it. The first third really reminds me of The Road by Cormac McCarthy, and I have to say it may be my favorite part. A lot of it is Cassie’s thoughts and the back story on the invasion, but I enjoyed her voice and seeing her character develop through her inner narration. The setting that Yancey paints is so desolate that I really began to believe Cassie really could be the last human left on earth, which makes it even creepier. The invasions aspects of this book were spot-on. It might be an old trope, but the idea of creating villains that pass for humans WORKS nearly every time because it’s just so terrifying, and The 5th Wave is no exception. The fact that the aliens could be anyone–ANYONE–made me just as paranoid as Cassie. Let’s just say I spent the next hour after finishing the book becoming increasingly paranoid about an alien invasion before I was able to calm myself down. And that’s why The 5th Wave is so effective– it managed to worm its way into my brain and stay with me long after I had left Cassie. Final Impression: This book COMPLETELY lived up to it’s hype! Cassie is one of my favorite main characters of the year, and she’ll probably be on my favorite characters ever list as the saga continues. I am anticipating book 2 and in the mean time, I’ll definitely be recommending this one, even if alien invasions are you’re normal thing(because they sure aren’t mine! ).5/5 cupcakes.